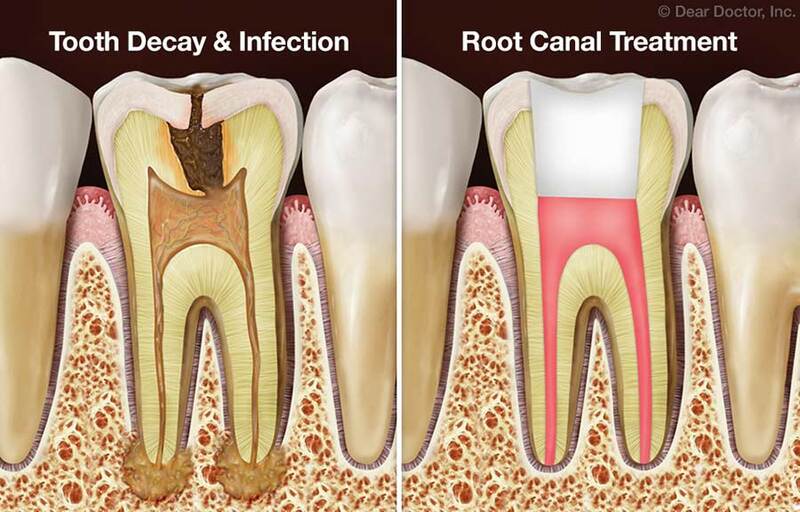 If you have been told you need root canal treatment, you may be feeling a bit nervous. Not to worry — treating root canal problems is a routine part of dentistry that can relieve certain kinds of tooth pain and help your teeth last longer. As you learn more about this beneficial procedure, you will understand why it's needed — and how it will leave you in far better shape than you were when you came in to the dental office! Here are some answers to frequently asked questions. We could remove the whole tooth, but it's always better to try to save it — especially since root canal treatment is routine and has a very high success rate (over 90%). Saving the tooth can prevent other troubles from occurring later on; these could include bite problems from teeth shifting position, difficulty eating, and loss of jawbone volume and density. After numbing the area, a tiny hole is made in your tooth to access the pulp chamber and canals. After we remove the diseased tissue, we will disinfect the chamber and the canal(s) all the way to the root end(s). Teeth in the front of the mouth have one root and generally one canal; back teeth have two or three roots and generally three or four canals. We will fill those canals and the pulp chamber with an inert, biocompatible material, and seal it with adhesive cement. The access hole will receive a temporary filling. Your tooth may feel sensitive for a few days, but any discomfort can usually be relieved with over-the-counter pain medication or anti-inflammatories like ibuprofen. You will be instructed to avoid chewing on that tooth until it receives its permanent filling, which can be placed a few days later. Depending on how damaged the tooth was to begin with, it may need a full-coverage crown. We will discuss your options with you. Keep your teeth decay-free by brushing and flossing every day. Eat a healthy diet low in sugar and avoid acidic beverages such as soda. Come in to the dental office regularly for professional cleanings and exams. And if you're active in sports, consider ordering a custom-made mouthguard to protect your teeth from injury.